Knotted necklaces fall into two basic categories - traditional pearl knotted necklaces that use fine silk cord with tiny knots tied in between each bead, and more contemporary styles of knotted necklaces that utilize thicker bead stringing materials (such as heavier natural, or nylon, cording and leather) with larger knots tied in various ways and places as either a focal point or major design element in the beaded necklace. Learning how to pearl knot a freshwater pearl necklace was one of Cara’s and my first bead stringing projects. I really got into pearl knotting (more than Cara did) and didn’t want to put it down. Cara loves teasing me about how, just after learning how to pearl knot, she came downstairs in the middle of the night to find me up in my chair still pearl knotting, what was by then, a long (long) length of freshwater pearls. I confessed that I had really gotten into the process and had accidentally exceeded my initial desired necklace length (which is hard to come back from when pearl knotting). So, at that point, I had decided to make lemonade and just kept going so that I could make it a long wrap necklace instead (which ended up working out great). 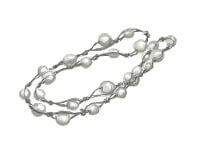 We have several different pearl-knotted necklace patterns for you to make. However, the more contemporary knotted necklace styles are a newer area of interest for Cara and me, and so we’ve got a bunch of fun and interesting knotted necklace designs that we’re going to make beading patterns for in the very near future.